Last year my cucumbers were a dismal failure. I grew the outdoor variety "Marketmore", which had done well for me the previous year. In 2011 I got only one cucumber fruit, and it was small and bitter. This year I have tried a different approach. I have gone for "Iznik", a so-called cocktail style of cucumber (also known as the Lebanese cucumber). This type grows on small plants and produces small fruits - about 5 or 6 inches long, as opposed to the "normal" 12-inch ones. Never having grown this type before I was unsure about when to pick them, but fortunately the seed packet had a good illustration on it, and I used this as my guide. And here's a more scientific indication of its size. You can see that it measured approximately just over 4" - let's say 11cm. We ate this cucumber literally as a cocktail fruit. I sliced it into quarters lengthways and we ate these dipped into salt, alongside a drink before dinner. It was really nice: firm and crunchy; not too many seeds; not indigestible. I think I can afford to let the next ones get a little bit bigger though, but at least I now know what to expect. The fruit I harvested came from a plant that looks far from healthy (on the right in the photo above), but the second plant, raised much later, (left) looks better, so there is reasonable hope of more fruits to come. Actually the older plant already has 5 more tiny fruits developing. You can probably guess from the tripod support arrangement that I installed that I had originally planned to have three plants in that tub, since they were never likely to get very big. There were only six seeds in the packet I bought, and I sowed them all. One rotted before germination, and three more died before reaching maturity. These were expensive F1 seeds so I can't save my own for another try next year. Can anyone recommend a good non-F1 Lebanese cucumber that is available in the UK? "ACHICA is the UK's first members-only home and luxury lifestyle store where members can enjoy luxury brands combined with excellent value for money. Members can save up to 70% off RRP on leading Home, Lifestyle, Fashion, Food and Drink, Art and Object, Childrenswear and Nursery and Travel, through 48 and 72 hour promotions, with many well-known and new exciting brands included." The winners will be announced on Friday 20th July. I have harvested the first of my new potatoes! I have 22 tubs / pots of potatoes on the go. Today I harvested the first one. It was a plant of the ever-popular variety "Charlotte". I know these tubers would have grown bigger if I had left them to do so, but I was impatient and keen to see how big they had grown. The yield from one pot turned out to be exactly the right amount for a 2-person helping. It was 350g. Well, this may not be a large quantity, but they were definitely Class 1 potatoes. Very clean; no scabs at all; a lovely creamy white colour; and the classic kidney shape so characteristic of the Charlotte variety. 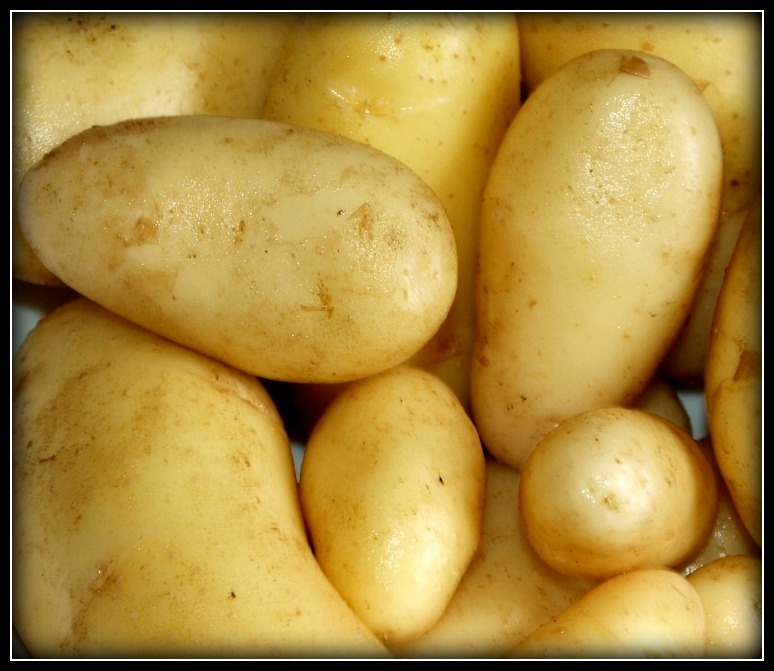 Incidentally, it has always puzzled me why the variety we know as "Jersey Royals" are officially called "International Kidney" when they are not kidney-shaped! All you have to do is slice some onion and Red Cabbage and cover it with vinegar, adding a small quantity of sugar (or Truvia in our case), and leave it to stand for a few hours. After about 6 hours, mine was a lovely texture - slightly softened, but still with a fair bit of "bite" - an amazing colour, and a really zingy flavour. I used a mixture of Malt and Wine vinegar, simply because we hadn't much of either. My Gammon was just an "ordinary" joint bought from the supermarket, but I livened it up a bit by spreading a generous layer of wholegrain mustard on it before cooking. As the meat cooked, the mustard melted and permeated it. The skin went almost like crackling, though not as crispy, and the meat inside was moist and succulent. Here's my whole plateful:- Gammon, potatoes (with loads of butter! ), cauliflower, carrots, my Red Cabbage pickle, and a spoonful of home-made Crab Apple jelly. You will notice that I cut the potatoes in half before cooking them. This stops them splitting, which can often happen with very fresh potatoes. We usually don't do anything fancy with home-grown new potatoes. They are just too good to muck about with! This is the one I'm most proud of at present. I have flowers forming on the Aubergine plants! Everyone tells me I'll be lucky if I get any fruit at all from these plants, but I'm determined to have a try. There are lots of fruits on most of the Tomato plants, but they are a long way from maturity. One of my Cucumber plants has four or five tiny fruits forming. Actually, the first one is nearly at a pickable size, so I'll showcase that one elsewhere. I think Ill be harvesting the first of my Broad Beans in about a week or so - maybe earlier, at the rate they are currently expanding. The Runner Beans have mostly reached the tops of their canes now, and are beginning to produce some flowers. Probably a month before I can pick anything from them though. Lots of Chillis flowers. Not many fruit yet. The Sweetcorn is growing at a rate of about an inch a day. It's loving the wet conditions, but it's no doubt also grateful for the support mechanism I provided for it, on account of the strong winds we are getting so frequently. The first cobs are now visible, though very tiny. Even the rather sickly-looking Squash plants are producing some flowers. This one on a "Butterbush" looks like a male flower, since it doesn't have a tiny embryonic fruit behind it. I have high hopes of the Purple-podded Desiree peas. The plants have grown very big, completely eclipsing the poor Premium and Boogie ones. Lots of pods are forming too. This is probably the next type of veg that I will actually harvest - kohlrabi "Modrava". I have four of these growing in pots. I reckon they might be ready at the end of next week. For me there's always a dilemma: if you harvest early you get a small crop of young veg that are more tender, but if you delay harvesting you get a greater yield of potentially tougher veg. Which is the best approach? Well, it's somewhere in the middle isn't it? Judging when to pick is something that you only learn through hands-on experience. And I think it is always a good idea to try to grow veg that don't all mature at the same time, so that you can extend the harvest period. You can achieve this partly through successional sowing and planting, but you also need to choose the right things to grow. For instance, some tomato plants will yield fruit progressively for several weeks in a row, as will beans, but a cauliflower is a "harvest once only" sort of veg. Regular readers will know that my garden never produces a glut of anything. I prefer to grow small quantities of lots of different things so that, as far as possible, there is always something nice ready for harvesting. 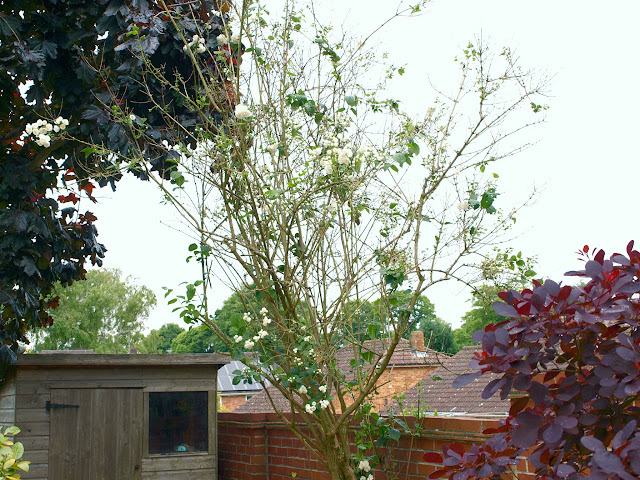 A few weeks ago I thought my Philadelphus tree was a goner. The (numerous) local pigeon population suddenly decided that Philadelphus leaves are the greatest delicacy on earth, and they stripped the tree bare of all its fresh young leaves. Perverse creatures, these pigeons, because they have ignored all the brassica plants in my garden, which pigeons usually can't resist. Well, anyway, much to my relief (not to mention surprise) the poor tree has still managed to produce some flowers. Not as many as normal, but at least some, so they are best looked at in close-up rather than from a distance. I suppose I do also have to show you what the tree looks like from a distance, since I have committed to displaying both successes and failures in my garden... It's a bit sparse, isn't it? This is what it looked like last year at the same time - and I thought then that it had done so badly that I would probably cut it down! Well, I think this time I really will have to do something drastic. I plan to prune the tree VERY severely once the flowers have faded, in the hope of persuading it to produce a mass of new branches in time for next year. Most of the flowers appear on the soft new growth at the tips of the branches and not on the old wood anyway, so I think this must be the right thing to do. Obviously I can't demonstrate how nice these blossoms smell, but let me just remind you that the Philadelphus is also know as the Mock Orange, because its scent is similar to that of Orange blossom - and very nice it is too! Yes, I agree, what an odd title for a blogpost. But it's true, they are floppy. Is this normal, I ask? Earlier in the year they were quite perky and stood upright. Now they have flopped over. They have plenty of lush green leaves. Maybe too lush? Is this an effect caused by a surfeit of rainwater (and consequent dearth of sunshine), or is it normal practice? I don't know, because I have only grown Shallots once before (a long time ago) and that was a total failure. However, some of you out there presumably grow Shallots every year and you will know the answer, so I'd love to hear your views please. Looking closely at the Shallots underneath all that foliage it appears that they are doing OK.
Each one that I planted has duly separated into a number of new bulbs, though perhaps not as many as I had hoped. What is a normal yield, would you say? 5 or 6 new bulbs from each one planted? More? Yes, you guessed it: floppy. But if they continue to develop as at present I still think they will deliver a worthwhile result. Actually I'm tempted to use the pot-grown ones as Spring Onions, though I suppose the taste might be very mild. I'd be very interested to hear from anyone who can advise me on this. It isn't covered in any of the gardening books I own. Apologies for my low profile over the last few days, folks. Our internet connection has been down since Thursday. Who would believe that any ISP, let alone the allegedly "best in the UK" one, would leave a customer of a so-called 24 x 7 service without any connection for FIVE DAYS?? 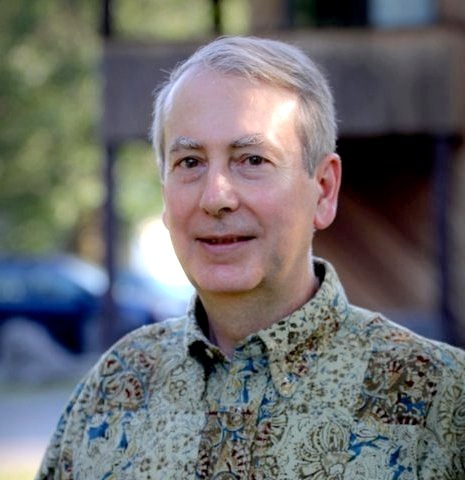 Hopefully by the time you read this, our connection will have been restored, but it's times like this that I'm really grateful for Blogger's ability to pre-schedule blogposts. Well, I was obviously wrong, because these spurs went on to produce plenty of leaves, but no flowers. Of course, it may be that the pruning had nothing to do with it. I have read that for various reasons (such as insufficient water) fruit trees can develop a biennial habit - in other words they fruit only in alternate years. This year they will certainly not be able to complain about lack of water unless the weather changes very dramatically! Things are slightly better on the Apple front. Last year the tree ("Scrumptious") was looking pretty much past it and I very nearly dug it up. However I have gone to great lengths over the Winter and Spring to feed it (with Vitax Q4) and water it in the hope that it will respond by producing at least a few fruit. Just recently a lot of the immature fruitlets have dropped off, but I think this is the natural process called the June Drop, whereby a tree sheds any fruit that it feels unable to support. But there are also a couple of little clusters like this. In order to give the others the maximum chance of success, I intend to remove at least 2, possibly 3, of these fruitlets. The smallest one, and the scabby one at the bottom of the bunch. I have done my best to keep the pests under control too, but this tree seems to be an aphid-magnet par excellence, and there are only so many times I can spray it if I don't want to poison myself with harmful chemicals. Last year my Apple tree suffered badly from Bitter Pit, an ailment associated with an inability to absorb calcium from the soil due to excessive dryness, so again I will be trying hard to avoid it this time round, by extra-conscientious watering. These two fruits don't look bad at present, so who knows, I might be eating home-grown apples again after all. If I can get the Apple tree back into reasonable condition, I might be tempted to try an Apricot, but I'm seriously considering growing whatever I get in a big pot rather than in the soil, because I think I would be able to control its water consumption better that way. 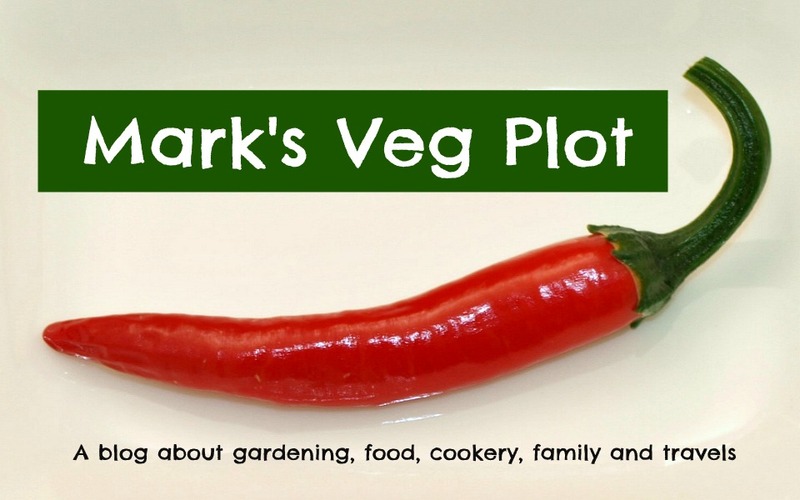 I recognise that Mark's Veg Plot is not noted primarily for its ornamental nature. After all it's not called "Mark's Flower Plot"! However, since taking up photography I have become keener on the ornamental aspects of the garden. I offer you here a little collection of photos aimed at demonstrating this. 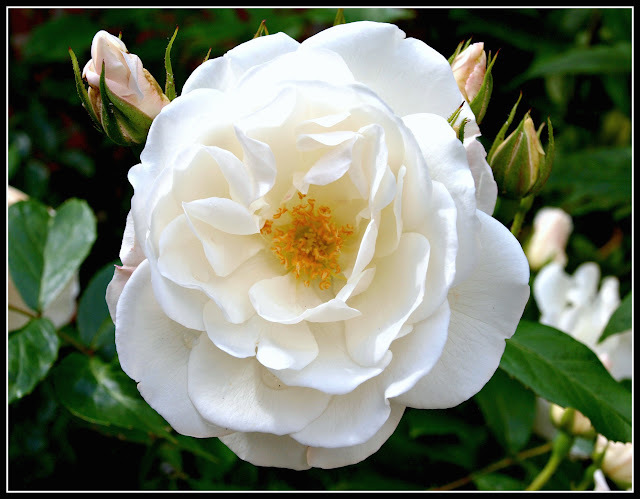 This is a Rose. I don't know its name, because it was in the garden when we bought this property. It produces dozens and dozens of flowers every year - usually in two batches. One batch is produced early in the Summer, but then the dreaded Black Spot disease strikes it and all the flowers and leaves drop off. At this point I prune it very hard and it does its thing all over again. This is the Oxalis "Burgundy Wine". Love it or hate it (for its invasive nature? ), you have to admit that this is an impressive-looking plant. This is my recently-acquired variegated Geranium "Frank Headley". And of course this one is that fern (Dryopteris Erythrosora). And what about the humble Potato? Whilst not so special at a distance, it looks really great in close-up. A brief window of sunshine!